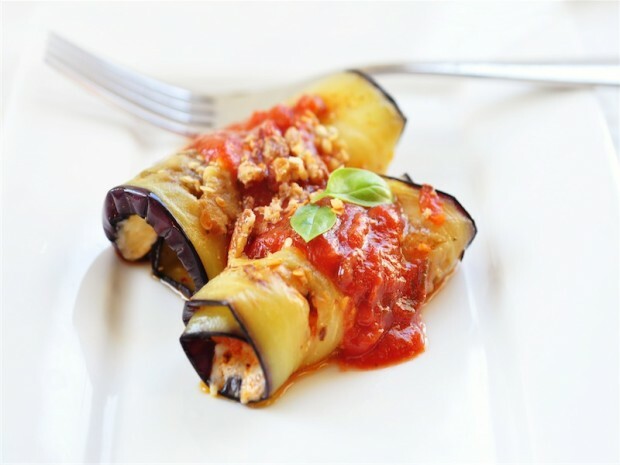 When you are in the mood for lasagna or eggplant parmesan, this is the perfect recipe to prepare. It is stuffed with yummy ricotta and mozzarella cheese and covered in diced tomatoes. It works great as a side dish or main course and you can easily add ground beef to get in some extra protein. 1. Lay eggplant on a baking sheet sprayed with a non-stick spray; place into a 350°F oven for 10 minutes and then turn eggplant. Cook other side till lightly browned. Cooking times will vary with each oven. 2. In a large mixing bowl combine the ricotta, mozzarella, 1/2 the diced tomatoes, Italian seasoning, salt, and pepper. 3. Add about 2 tbsp of the cheese mixture onto each piece of eggplant and roll. Place in a baking dish and cover with additional diced tomatoes. Bake for 10-15 minutes until the cheese begins to bubble on the sides.